NAKIVO Blog > VMware Administration > VMware Backup > Best Backup for VMware: Why NAKIVO? Best Backup for VMware: Why NAKIVO? Today is the time when virtualization becomes a new paradigm of the modern computing world. The idea of virtualization suddenly opened a way for massive virtual implementations, as if under the motto “Virtualize or Die”. This fast-developing trend inevitably brought data protection issues of its own, just like it was with hardware environments before. Once you have your VMware virtual infrastructure in place, the issue of your data protection would hardly leave the scene with VM backup as its primary element. What are the challenges and choices? There are a lot of things to consider and too little space in this post to discuss them, but our general advice for you is to follow VMware backup best practices to build your own data protection system. Some time ago, many backup administrators did not feel inclined to change their traditional backup strategy, treating a virtual machine the same way as a physical machine. With a virtualization avalanche spreading over the globe and the dramatic growth of individual virtual infrastructures, this approach proved to be wrong entailing inevitable system bottlenecks. Recognizing VM backup contingencies, VM backup software vendors worked hard to live up to market demands. The resulted solutions have seen multiple improvements since their early days and the most advanced of them, like NAKIVO Backup & Replication, have impressively much to offer. The product combines the most innovative technologies with global best practices. 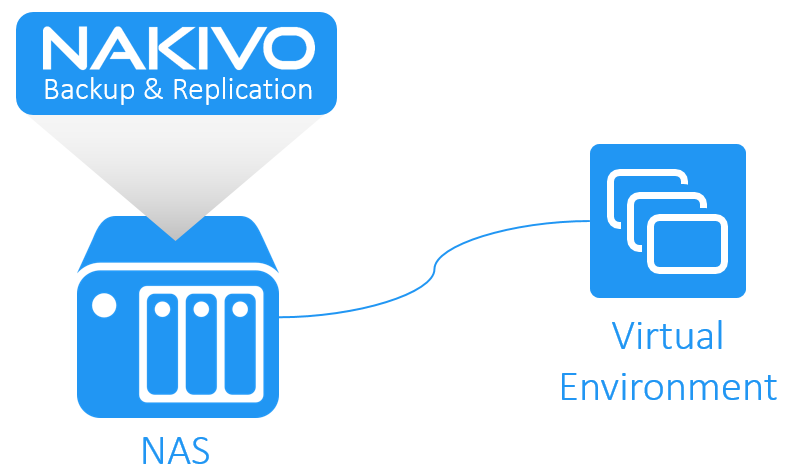 Let us take a peek at the aces NAKIVO Backup & Replication has up its sleeves. NAKIVO Backup & Replication relies on the forever-incremental backup method combined with the full synthetic mode of storing VMware backups in the backup repository. This allows you to perform fast, reliable, and full recovery of your VMware VMs and application objects, while keeping storage space and load on production network relatively low. NAKIVO Backup & Replication creates image-based backups. That means your entire VMware VM is captured during backup, and the VM backup reflects the state of the system at a certain point in time, that is, contains not only files and folders, but also system configuration, applications, discs, and all related data. Therefore, should some disaster strike your infrastructure, you will be able to instantly restore the virtual machine at its actual point-in-time. Another good point is that modern image-based solutions need no software agent installed on source and target hosts. NAKIVO Backup & Replication integrates seamlessly with your VMware virtual infrastructure via VMware vStorage API for Data Protection (VADP) and interacts with it without having to engage any assisting software. Beside its image-based approach to VMware backup, NAKIVO Backup & Replication creates “application-aware” or, in other words, application-consistent backups. It means that backups capture not only full VM image/snapshot, but also allow applications to complete their pending transactions and flush memory data to disk, so that they are in a consistent state when the snapshot is taken, freezing the system for an instant. When the snapshot is complete, the applications resume running. Restoring an application-aware backup to bring such applications to a consistent state requires no additional efforts. While VMware is providing its proprietary tools, VM backup software vendors are leveraging them. Changed Block Tracking (CBT) is designed to facilitate creating incremental backups, and NAKIVO Backup & Replication makes full use of this VMware feature through the VMware Data Protection API. The CBT module monitors changes in the VM data blocks and makes records in a specific changed block tracking log file. The advantage of using VMware Changed Block Tracking is that it helps NAKIVO Backup & Replication perform forever-incremental backup much faster and improves the efficiency of the entire backup process. Storage space may be a VMware backup issue, since VM backups may grow dramatically pushing the infrastructure maintenance budget up. NAKIVO Backup & Replication handles storage space with impressive accuracy, engaging several techniques to reduce the size of the storage content. One of these techniques stipulates skipping unnecessary data, while performing VMware backup: the product automatically excludes swap files and partitions, which usually go in bulk into VM backup and produce extra load on the network and consume a large amount of storage capacity. Other techniques providing for the reduction of backup repository size are global data deduplication and compression. The data deduplication feature handles raw data while performing VMware VM backup by excluding backup data blocks, which are identical to those already available in the backup repository. The data compression feature’s name speaks for itself. Moreover, it provides for faster data transfer via network. Transaction logs may periodically become a bottleneck for running database apps or VMware backup jobs, as these files can fill up the storage space and cause a premature termination of transaction, or even take your system down by blocking all incoming transactions. To prevent transaction log jams, NAKIVO Backup & Replication is equipped with transaction log truncation tools for both Microsoft SQL Server and Microsoft Exchange. Thus, during VMware backup, you can select all VMs or specify individual VMs, and the product will automatically perform truncation of log files on the original VM after completing a VM backup job. Screenshot verification is an innovative technology available in NAKIVO Backup & Replication, which allows verifying the integrity of VMware VM backups. This feature is performed due to the built-in Flash VM Boot technology, which presents VM backup as RDM disks in virtual compatibility mode and mounts them to a newly created VM. NAKIVO Backup & Replication instantly recovers a VM from its VMware backup, waits for the OS to boot, and then takes a screenshot and emails it in a report to the administrator as proof of the consistency and integrity of the above VMware VM backup. NAS (Network Attached Storage) servers are gaining popularity as independent storage devices equipped with a number of built-in features. NAKIVO co-operates with world-leading NAS manufacturers, such as QNAP, Synology, ASUSTOR, and Western Digital, implementing state-of-the-art storage technologies by turning a NAS into a VM backup appliance. Thus, you get an all-in-one device combining backup software, hardware, storage, and a variety of VM backup options. Backup data is written directly to NAS disks, bypassing the overhead of CIFS and NFS network protocols, which makes the VMware backup process extremely fast, without creating extra workload on your network. Running VMware backup jobs imposes a heavy workload on the network, since large amounts of data are transferred. This may affect your routine business operations. To optimize VMware backup traffic, NAKIVO Backup & Replication offers you the LAN-free data transfer technology that is based on the Direct SAN Access and HotAdd techniques. The Direct SAN Access mode relies on reading and transferring data directly from a SAN storage device over a Fiber Channel or iSCSI, ensures a much higher speed of your VMware backup operations, and greatly improves the VMware backup performance overall. Another option, the HotAdd transport mode, is designed to read your VM data directly from VM datastores through the storage I/O stack, bypassing the host’s TCP/IP stack. A snapshot of a source VM is “hot added” as a virtual disk to the VM that runs VM backup software. This technique also improves VMware backup performance. A good VMware backup practice ensuring VM backup protection is to have an extra copy of your VM backup data in a secondary repository offsite or in the cloud. NAKIVO Backup & Replication can automatically copy your VM backups to a designated offsite location or to the cloud (AWS or Azure). Your data will be safe, even if your whole data center is down or struck by a disaster. Since LAN and WAN links are often slow due to limited bandwidth, NAKIVO’s Network Acceleration feature based on data compression and traffic reduction techniques speeds up your VMware backup jobs by up to 2X in LAN and WAN networks, which makes a lot of sense, if the backup data is transferred to a backup repository located offsite or in the cloud. Transferring and keeping VMware backups offsite, as recommended by backup best practices, requires some precaution against exposing your sensitive data to a potential threat of unauthorized access. Encrypting your VMware backup data before sending it to some offsite repository would be a sound step in your data protection policy. NAKIVO Backup & Replication includes the encryption feature based upon the industry-standard AES-256 encryption algorithm. Below you can see the example of enabled product features: App-aware mode, Network acceleration, and Encryption. 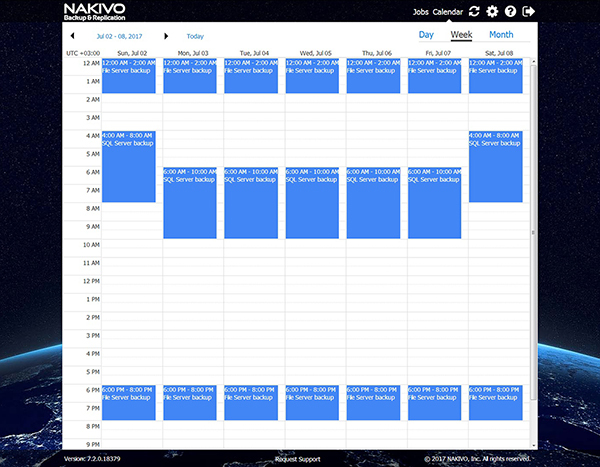 In the Calendar dashboard of NAKIVO Backup & Replication, you can see all of your past, current, and future VMware backup jobs in a traditional calendar view. The Calendar dashboard displays the actual and predicted duration of each VMware backup job at specified dates and time. Scheduling new jobs is easy, and you can insert them in free time slots to avoid overlaps. 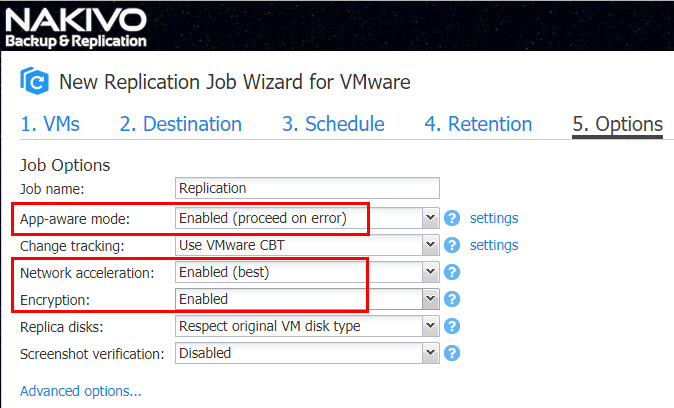 This feature also provides for establishing multiple schedules for a specific VMware backup job, so it can run at different times, best fitting your infrastructure workflow. NAKIVO Backup & Replication supports multi-tenancy by allowing you to create and manage isolated groups or, in other words, tenants, within one product deployment. It provides for an easy and cost-effective VMware backup service to your departments or customers through individual portals to transfer VM backup tasks control and handling to multiple virtual machine backup administrators. This feature provides an excellent opportunity to develop your Backup-as-a-Service (BaaS) and Disaster-Recovery-as-a-Service (DRaaS) businesses. With NAKIVO Backup & Replication, all your VMware backup operations can be easily automated. You do not have to bother and put much effort into routine task management. Your virtual infrastructure prioritized areas will always be protected in the form of entire VM containers – resource pools, hosts, clusters, etc. Any VM newly created in or moved to such containers is automatically included into the related pre-scheduled VM backup job. You can also go much further in automating your business processes. The product provides HTTP APIs for its specific customized integration with any other software solutions. With NAKIVO’s innovative technology, you can browse, search, and recover any VMs, files, Microsoft Exchange, SQL Server, and Active Directory objects directly from deduplicated and compressed backups without restoring the entire VM first. This feature needs no agent and works for all types of VM backup, including VMware backup. Dedicated to integration with VMware solutions, NAKIVO Backup & Replication is a set of state-of-the-art VMware backup technologies combined in a single product. The product improves your VMware backup performance and recovery, enables fine-tuning your optimal Recovery Point Objective (RPO) and Recovery Time Objective (RTO), and provides for the efficient use of storage and network resources. Besides the features mentioned above, NAKIVO Backup & Replication has much more to offer, including both horizontal and vertical scaling out along with your environment to support higher workloads. As a flexible VMware backup and disaster recovery tool, NAKIVO Backup & Replication provides seamless integration with your VMware infrastructure and ensures smooth and well-balanced performance of your data protection system. Therefore, download the full-featured Free Trial of the product or request a Live Demonstration.